The dusitD2 Kenz Hotel ... complete. Engineering Contracting Company (ECC) has announced the completion of dusitD2 Kenz Hotel, a four-star hospitality project located in Barsha Heights, Dubai, UAE. 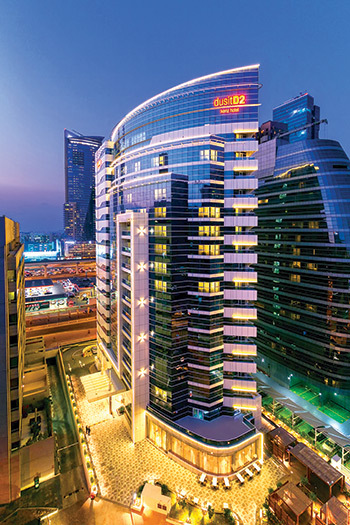 The 240-key DusitD2 Kenz Hotel is the first hotel to be launched in the UAE under Dusit’s contemporary dusitD2 brand. The hotel includes a health and fitness centre, swimming pool and spa, restaurant, waterfront lounge, meeting facilities and two restaurants. The construction contract for the 17-storey hotel was awarded to ECC in late 2013. ECC said it has more than 7,000 qualified team members and an extensive supply chain, which allows it to deliver projects on time. The ECC Group, through its sister companies such as Abanos Interior Fit Out and Joinery, United Masters and Prime Metal Industries, is also able to provide all construction-related services for its clients.